When I started working with Kevin it was painful just to walk. Through a program of targeted strengthening, foundation training, and resistance stretching I not only avoided knee surgery, but am back participating in high-impact sports at full speed. Working with Kevin has allowed me to be a pain-free weekend (and weekday) warrior. Kevin has been my personal trainer for approximately 3 years. He has helped me climb a mountain. When I first met Kevin, I had recently lost my husband and had been diagnosed with beginning stage Parkinson’s Disease. I had problems with balance and trouble walking. I was weak and had no strength. I felt defeated. I couldn’t sleep and had to take medication. My self-esteem was low and I had no excitement about life. Kevin assessed my needs, developed a program, and began to guide me up the mountain. Each session he presented a new exercise, a new challenge, and a goal to work on. He always praised and only pushed to a limit. Kevin stays on top of current health issues, healthy food ideas and exercises. He attends seminars, learns different techniques, and then incorporates these into his training. Recently he attended an instructor certification called “Foundation Training”. These new back and core strengthening exercises have helped me in my daily life. I am now strong enough to bend down (hinge at the hip, as he says) and get a heavy pot from a cupboard with one hand. I can carry 2 bags of groceries at once. My backaches are few now. I take 30-minute walks daily. I have more energy to play with my grandchildren and I sleep without medications. I haven’t had a cold in over a year. Kevin has saved my life. He stood beside me as I worked hard to get strong. Thanks Kevin for the happy, healthy new me. 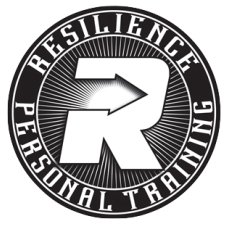 Resilience Personal Training is a great place to work out. This studio provides personalized and attentive training and offers a wide variety of incredible classes, including upper- and lower-body classes, circuit training, and Foundation Training. Resilience PT introduced me to the latter class, Foundation Training, which has immensely helped my posture and confidence. When I go to Resilience PT, I can always expect an energized environment, supportive fellow training mates, and an opportunity to work hard. Trainers Kevin and Adrian are always open to communication and will do their best to help you succeed at your goals. I have tried many different workout programs, gyms, and trainers. Sometimes I have seen great results and other times I have not seen any improvements, but working out at Resilience with Kevin and Adrian since June, I have seen a steady increase in my strength, coordination, endurance, and my overall performance. I am more aware of my body than ever before, which is saying a lot as I have also been a yoga teacher for 6 years. My posture has greatly improved due to awareness and Foundation Training, my core muscles are more engaged then they have ever been and I am more connected to my body and movements then ever before in my life. I do personal training with both Adrian and Kevin as well as group classes every night of the week and I absolutely love it! I look forward to working out at the end of a stressful day, it is a huge relief and the way that I let go of any tension or negative feelings in my mind and body. The community there is great and I look forward to seeing my workout buddies every day. We are all so positive towards each other and help to motivate and cheer each other on. It is definitely my favorite training environment! There is a great, open and honest family feel, very comfortable and not intimidating at all. I look forward to going there every day and that is the most important thing, I have fun at my workouts and I leave feeling amazing and confident! Thanks Kevin for throwing in your special measure of inspiration. You make your gym fun and informal. It is a place where we can all feel safe, understand our goals, grow stronger without the high powered pressure of larger gyms. And Adrian, well I can’t say enough! He is truly amazing, committed, respectful to all of his clients. He intuitively understand our needs, is observant, devoted, and sincerely interested in increasing our knowledge about health and fitness. He loves to make things challenging for everyone! I have total respect for this young man. I am looking forward to more of the same in the coming year, and of course, increased challenges. Why not!